Pirate Ship also called pirate boat, viking boat, corsair etc. It belongs to ferris wheel category. Pirate ship make movement along with one horizontal axis. 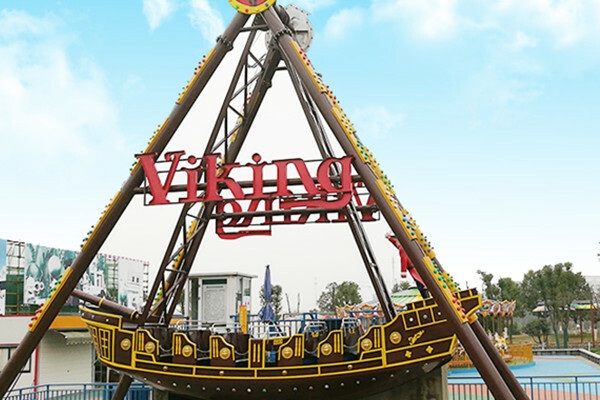 After passengers sit well, the operator presses the button, driven by the friction wheel, the rides can swing up and down gradually, it is a healthy and entertainment projects, popular by majority of customers. For the main structure, through the hanger frame, brackets hanging in mid-air on the horizontal axis, driven by hte rubber friction wheel, the boat can generate swing, because the rubber wheel are flexible, so it is play an important role on the extension the life of hte equipment and bearing. It decorated with thousands of LED lights, with beautiful music, passengers sit in the cabins fly down and up, the whole scene is very lively & spectacular.